Standing before a giant map in his Dallas office, Bill Minick doesn’t seem like anyone’s idea of a bomb thrower. But backed by some of the biggest names in corporate America, this mild-mannered son of an evangelist is plotting a revolution in how companies take care of injured workers. Each state determines its own workers’ compensation benefits, which means workers in neighboring states can end up with dramatically different compensation for identical injuries. His idea: Let them opt out of state workers’ compensation laws — and write their own rules. Minick swept his hand past pushpins marking the headquarters of Walmart, McDonald’s and dozens of his other well-known clients, and hailed his plan as not only cheaper for employers, but better for workers too. “We’re talking about reengineering one of the pillars of social justice that has not seen significant innovation in 100 years,” Minick said. Minick’s quest sounds implausible, but he’s already scored significant victories. Many of the nation’s biggest retail, trucking, health care and food companies have already opted out in Texas, where Minick pioneered the concept as a young lawyer. Oklahoma recently passed a law co-written by Minick allowing companies to opt out there. Tennessee and South Carolina are seriously considering similar measures. And with a coalition led by executives from Walmart, Nordstrom and Lowe’s, Minick has launched a campaign to get laws passed in as many as a dozen states within the next decade. But as Minick’s opt-out movement marches across the country, there has been little scrutiny of what it means for workers. ProPublica and NPR obtained the injury benefit plans of nearly 120 companies who have opted out in Texas or Oklahoma — many of them written by Minick’s firm — to conduct the first independent analysis of how these plans compare to state workers’ comp. The investigation found the plans almost universally have lower benefits, more restrictions and virtually no independent oversight. Already in Texas, plans written by Minick’s firm allow for a hodgepodge of provisions that are far different from workers’ comp. They’re why McDonald’s doesn’t cover carpal tunnel syndrome and why Brookdale Senior Living, the nation’s largest chain of assisted living facilities, doesn’t cover most bacterial infections. Why Taco Bell can accompany injured workers to doctors’ appointments and Sears can deny benefits if workers don’t report injuries by the end of their shifts. 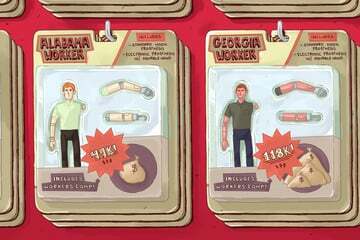 And it’s Minick’s handiwork that allows Costco to pay only $15,000 to workers who lose a finger while its rival Walmart pays $25,000. Unlike traditional workers’ comp, which guarantees lifetime medical care, the Texas plans cut off treatment after about two years. They don’t pay compensation for most permanent disabilities and strictly limit payouts for deaths and catastrophic injuries. The list of what the plans don’t cover runs for pages. They typically won’t pay for wheelchair vans, exposure to asbestos, silica dust or mold, assaults unless the employee is defending “an employer’s business or property,” chiropractors or any more than 75 home health care visits. Costco won’t cover external hearing aids costing more than $600. The cheapest external hearing aid Costco sells? $900. The plans in both Texas and Oklahoma give employers almost complete control over the medical and legal process after workers get injured. Employers pick the doctors and can have workers examined — and reexamined — as often as they want. And they can settle claims at any time. Workers must accept whatever is offered or lose all benefits. If they wish to appeal, they can — to a committee set up by their employers. In many cases, ProPublica and NPR found, the medical director charged with picking doctors and ultimately reviewing whether injuries are work-related is Minick’s wife, Dr. Melissa Tonn, an occupational medicine specialist who often serves as an expert for employers and insurance companies. Workers’ comp was founded on the premise that employers owed a duty to injured workers and their families. And laws in every state require them to pay workers’ medical bills and some of their lost wages until they recover — or for life if they can’t. Earlier this year, a ProPublica and NPR investigation detailed how states have chipped away at these guarantees. A series of new laws has cut benefits, given employers and insurers more control over medical care, and made it more difficult for workers to qualify for coverage. But other than Texas and Oklahoma, no state has allowed companies to simply opt out. Minick, 55, markets his vision as a cure for the endless cycle of cuts. Yet Minick’s push has united an unlikely set of allies — unions, trial lawyers and insurance companies. 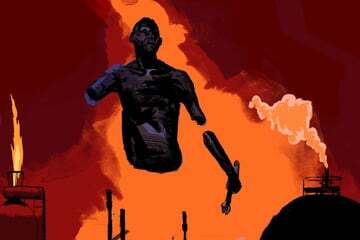 They say his idea isn’t progress, but a return to the Industrial Age before workers’ comp, when workers and their families had to sue their employers or bear the costs of on-the-job injuries themselves. Mike Pinckard, a Fort Worth truck driver for 31 years, remembered when his employer, Martin-Brower, McDonald’s largest distributor, announced last November that it would be switching to an opt-out plan. “They told us this was going to be the best thing, that this was going to be better than workers’ comp,” he said. Two months later, Pinckard said, he was pulling a cart loaded with frozen French fries when he slipped on some ice in his trailer and suffered a hernia. He had previously had two hernias on the job that were covered by workers’ comp and figured this time would be no different. But the denial letter said the plan for Reyes Holdings, which owns Martin-Brower, only covers two types of hernias — not the kind Pinckard suffered. In this instance, as in others ProPublica and NPR found, the costs of the injury were shifted to the employee, group health or government programs. Pinckard, 58, said he’s spent over $10,000 in deductibles and copays after getting the hernia covered by his health plan. Texas has always allowed employers to opt out of workers’ comp. But until insurance premiums started rising rapidly in the late 1980s, most companies considered it foolish because carrying workers’ comp protected them from lawsuits. Minick was a young lawyer for one of Dallas’ oldest firms in 1989, when some of the firm’s business clients, gambling that the cost of any lawsuits would be cheaper, began dropping workers’ comp. The senior partners assigned Minick and several colleagues to come up with an alternative. They found it in the Employee Retirement Income Security Act, a federal law passed in the early 1970s to protect workers as employers were shedding their pensions. ERISA had been applied similarly to other worker benefits, such as health plans and disability policies. Minick and his colleagues decided it could provide a legal framework for plans covering on-the-job injuries. Texas courts agreed, even though, compared to workers’ comp, the ERISA-based plans gave employers critical advantages. Under ERISA, appeals are heard in federal court, rather than state workers’ comp courts. And in general, judges could rule only on whether a denial was reasonable — not whether it was fair. This gave employers far greater control. As more and more companies adopted plans, in 1994 Minick struck out on his own. His consulting firm, PartnerSource, soon became a one-stop shop for companies looking to drop workers’ comp. For a flat fee, PartnerSource hooks companies up with insurance carriers, claim administrators, medical networks and defense lawyers. It also serves as the first line of defense, reviewing claims and advising companies how to avoid lawsuits. Already, such plans cover nearly 1.5 million workers in Texas and Oklahoma — more than are covered under 21 states’ workers’ comp systems. PartnerSource writes about 50 percent of the opt-out plans in Texas and nearly 90 percent in Oklahoma, alone covering more workers than 14 state programs. PartnerSource’s offices overlook a posh part of Dallas. The firm’s walls are a monument to Minick’s success, decorated with framed thank you letters from companies who’ve hired him. Inside his office, the mementos are different, reflecting his values. There are pictures of Boy Scouts trips he’s led and letters from charities he’s supported. The radiant plumage of a pheasant he shot is stuffed and mounted next to the doorway. Minick sells his idea earnestly, speaking with a matter-of-fact certainty that disarms skeptics and defies arguments to the contrary. With practiced ease, he rattled off the common gripes about workers’ comp: Companies dig in their heels at the first sign of a claim and turn workers into adversaries. Insurers don’t communicate about benefits, causing workers to hire lawyers. Doctors are often picked based on discounts rather than quality. And the system, he said, has created a huge bureaucracy in the name of protecting workers’ rights. As a result, injured workers no longer have any accountability, he said. They can report claims late, skip doctors’ appointments and appeal every perceived wrong to workers’ comp court rather than trying to work it out with their employers. Under opt-out plans, Minick said, companies must be engaged in the process, educating new workers about their benefit plans and managing their medical care if they get hurt. This control allows employers to better monitor workers’ progress and ensure they return to work as soon as possible, he said. 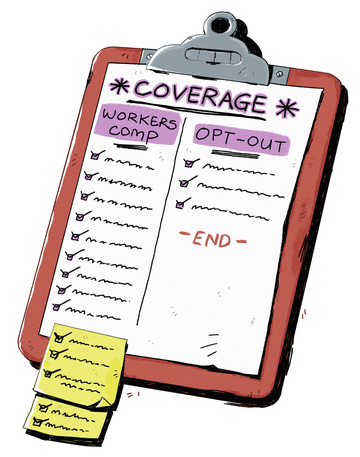 An analysis by Minick’s firm shows that opt-out plans save companies between 40 and 90 percent because they have lower costs per claim, get injured employees back to work faster and handle fewer disputes. That means greater employee satisfaction, Minick said. If the analysis is correct, Minick’s plans would herald an important answer to the nation’s eroding workers’ comp systems. But the only data available to assess his claims comes from his firm. More than 30 companies contacted by ProPublica either wouldn’t discuss their programs in detail or didn’t return calls. Steve Schaal, associate general counsel of Tyson Foods, said the company opted out in Texas to give it more control over which doctors workers can see and “to try to get our injured employees the best possible medical care.” Schaal said the company hasn’t taken a position on expanding opt out to other states. Tyson wouldn’t provide an updated copy of its plan. Employers aren’t required to submit any information about their plans with the state, since Texas doesn’t regulate opt-out plans. For several legislative sessions, employers have fought bills that would have required them to share their data. PartnerSource’s analysis comes with some significant, unstated caveats: Employers with opt-out plans tend to work in safer industries like retail, which typically has less severe, less expensive claims. The plans also don’t offer entire categories of benefits that state laws require and give employers more options to exclude complicated claims. For example, workers’ comp gives employees 30 days to report an injury in Texas. Under opt-out plans, employees typically must report by the end of the shift or in 24 hours or lose all benefits. Costco, which saw its costs drop 53 percent after opting out, acknowledged in a 2012 industry report that it denied some employees with legitimate work injuries because they reported late. Those workers, the report said, used their denial letters to get treatment under the company health plan. Minick and other proponents say while plans can make exceptions, such rules ensure workers get medical care as soon as possible, speeding their recovery. But public health experts say workers might not report minor injuries right away for valid reasons: They fear looking like troublemakers or worry about child care if they need to see a doctor or stay late filling out forms. Or, like Rebecca Amador, they simply might not realize an injury’s severity. Amador, a nursing assistant, was helping a patient transfer to a wheelchair at a Stephenville, Texas, nursing home in November 2013, when the chair’s brake unlocked, causing her to support the patient’s weight. She took a hot shower and went to bed. By the next morning, she remembers being in so much pain she could hardly breathe. As soon as she got to work, Amador told her supervisor, who sent her to the hospital. Only 19 hours had passed. But her employer, Fundamental Long Term Care, rejected her claim, saying she had failed to report it by the end of her shift. The company’s decision left Amador in a Catch-22. Even though her injury happened at work, the company’s Texas plan wouldn’t cover it. But because it was work-related, neither would her health insurance or short-term disability plan. Had she worked for Fundamental in one of the other states where it operates, her injury would have been covered under workers’ comp. Amador sought help at a publicly funded health clinic, where her doctor recommended a specialist. But she couldn’t afford one. She tried light-duty work until her doctor warned she could do further damage. Since then, Amador said, she’s been living off her son’s Social Security benefits and borrowing from a lawsuit settlement fund set up for him after his father died of mesothelioma. Her daughters help pay for medications, and she’s applying for Social Security disability. Sitting in her trailer nearly two years after the incident, she said her back burns like she’s in a fire, and she can’t even carry a two-liter soda bottle. The fine print of opt-out plans contains dozens of opportunities for companies to deny benefits. Employers can terminate workers’ benefits for being late to doctors’ appointments, failing to check in with the company or even consulting their personal doctors. One truck driver for a food and beer distributor complained in court documents that his direct supervisor accompanied him to medical appointments for his hernia — a requirement under the plan. Some plans have restrictions that read like the terms of criminal probation. While they’re healing, injured workers at W. Silver, a steel products manufacturer in El Paso, are prohibited from leaving the area, even temporarily, or engaging in any “pleasure” that may delay recovery. Sometimes the plans of PartnerSource and others abandon fundamental principles of workers’ comp. For nearly 40 years, every state has covered occupational diseases and repetitive stress injuries, recognizing medical research that some conditions develop over time. But in Texas, a number of companies, including McDonald’s and the United Regional Health Care System, don’t cover cumulative trauma such as carpal tunnel. U.S. Foods, the country’s second largest food distributor, also doesn’t cover any sickness or disease “regardless of how contracted,” potentially allowing it to dodge work-related conditions such as heat stroke, chemical exposures or even cancer. Since its beginning, workers’ comp has paid benefits regardless of whether the employer or worker was at fault. But several companies, including Home Depot, Pilot Travel Centers and McDonald’s, exclude injuries caused by safety violations or the failure to obtain assistance with a particular task. Under workers’ comp, employees can’t be fired in retaliation for a claim. But employers that opted out argued that their workers weren’t entitled to that protection, and in 1998 the Texas Supreme Court agreed. Gillespie, of the insurance association, said such provisions blatantly shift costs to taxpayers, in the form of Social Security disability, Medicare and Medicaid. Some plans state it explicitly: The plan for Russell Stover Candies said its benefits are secondary to all other sources of benefits. Home Depot requires its employees to “take whatever benefits are available,” including enrolling in Social Security disability. And as Joe Becker, a truck driver in Abilene, Texas, discovered, workers no longer have the promise of lifetime medical care for on-the-job injuries. Becker said he herniated several discs in his lower back in June 2012 when he hopped off his flatbed trailer after adjusting a load. 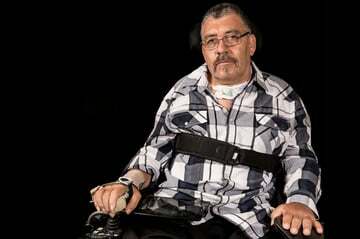 His employer, Dent Truck Lines, paid for surgery that put rods and screws in his back. The surgery helped, but the screws dig into his back, occasionally hitting a nerve. The doctor recommended surgery to remove the screws in 2014, medical records show. But because Dent’s benefit plan provides only two years of medical care, Becker was out of luck. “The whole deal is just kind of silly, like most of these deals are — people looking for free money,” he said. On the edge of being homeless, Becker, 44, applied and qualified for Social Security disability. He struggles to pay bills. For several weeks this spring, he said, he subsisted on a half a can of ravioli or SpaghettiOs a day. Under the bargain of workers’ comp, employees gave up their right to sue their employers in return for guaranteed care and wages. The tradeoff in Texas is that injured workers covered by opt-out plans can sue their employers for negligence, potentially winning millions of dollars. This risk is why many companies cap medical benefits at two years, Minick said. When injuries are severe enough to require lengthy medical care, many companies settle with workers, giving them a lump sum to cover future medical expenses and permanent disabilities. On a more basic level, the threat of lawsuits, Minick and other proponents assert, creates a healthy incentive for companies to keep their workplaces safe. But over the years, large companies have found a series of ways to reduce the risk of lawsuits. Under workers’ comp, employees denied benefits can typically get hearings before administrative law judges. They can appeal further to a workers’ comp commission and even up to the state supreme court. ELAP’s president said the goal is to provide an objective review of the claim outside of the company’s basic business model of reducing medical bills. If the claim is still denied, workers can file an ERISA lawsuit in federal court. But the judge is typically limited to deciding if the company followed its plan or acted arbitrarily and capriciously — not whether the company was right. A number of rulings by Texas courts have added to employers’ leverage, creating a higher bar for workers to prove their employers were negligent for common slip-and-fall and lifting injuries. Many companies have further limited the risk by requiring employees to sign arbitration agreements. Instead of going before a jury, workers’ disputes are handled confidentially, out of court, before an arbitrator, typically a former judge or defense lawyer. A 2010 survey of large employers with opt-out plans by a Stanford law professor found that 85 percent used arbitration agreements. Arbitration appeared to save companies money. Only a quarter of those companies had paid a claim over $500,000. And only 10 percent had paid more than one claim over $500,000 — compared with 38 percent of companies that didn’t use arbitration. For many years, several companies that opted out required new employees to sign pre-injury waivers saying they wouldn’t sue the company if they got hurt. Texas banned that practice in 2001. But many large meat and poultry companies, such as Tyson Foods, Cargill and Pilgrim’s Pride, continued to use post-injury waivers. After reports of workers signing waivers at hospitals — sometimes while still bleeding — the legislature tried to ban that too. The debate over waivers presented a turning point for Minick to demonstrate his political savvy. The largest group for employers that opted out, the Texas Association of Responsible Nonsubscribers, decided to support the ban, considering such practices abusive. That rankled several members of the state’s business chamber, who had opted out and wanted to preserve their ability to avoid lawsuits. With Minick’s help, they drafted legislation in 2005 that allowed waivers so long as there was a cooling off period of 10 days after the injury. Following the success of that measure, Minick helped chamber members form a new group for employers with opt-out plans. They called it the Texas Alliance of Nonsubscribers and hired the chamber’s longtime lobbyist, Richard Evans, who had been deputy legislative affairs director for George W. Bush when he was governor. For the first time, Minick became his clients’ political partner, guiding their ambitions to shape legislation and the future of workplace injury benefits. Recognizing the growth potential, the global insurance brokerage Arthur J. Gallagher & Co. acquired PartnerSource in 2009 in a deal that left Minick in charge. The financial terms weren’t disclosed, but documents filed with securities regulators in 2012 reveal that Minick and his partners, which included two charities, received $7 million in Gallagher shares as a bonus payment. Minick would soon begin justifying the investment. Spurred by Texas clients eager to opt out in other states, PartnerSource started looking at opportunities elsewhere. Their first target was due north: Oklahoma. Year after year, Oklahoma’s legislature had tried to overhaul its workers’ comp system to lower insurance rates, which were higher than those in surrounding states. But the changes only brought modest drops. In 2011, Minick brought a group of his frustrated clients together in the Oklahoma Injury Benefit Coalition, led by Hobby Lobby and the Unit Corp. drilling company. The group recruited Steve Edwards, the former state Republican Party chairman, as its lobbyist. The group’s first effort to pass an opt-out bill was narrowly defeated in 2012. But they returned in 2013 with a new partner, the State Chamber of Oklahoma, and a more ambitious plan — not only to pass an opt-out option, but to rewrite the entire Oklahoma workers’ comp law. The bill differed from Texas’ version in two ways. Employers would have to provide a minimum level of benefits matching state law. And, unlike Texas, employers would get to keep their immunity from lawsuits. A chamber lobbyist and a Unit lawyer wrote the bill, incorporating language from various interests, including Minick. “I was one of the primary drafters,” Minick said. One thing not disclosed: the Oklahoma bill copied language nearly verbatim from PartnerSource plans — making the definition of “accident” more restrictive than it was in traditional workers’ comp. Oklahoma’s opt-out law is remarkably similar to PartnerSource plans when it comes to the definition of "accident." (4) was independent of sickness, mental incapacity, bodily infirmity or any other cause. Gillespie, of the insurance association, said the wording could be used to deny almost any claim because nearly every injury has a cause. Since the law took effect last year, 59 companies, covering an estimated 22,500 workers, have opted out, ranging from small home health care agencies to national brands like Macy’s and Swift Transportation. Fifty-three have plans that were written by PartnerSource. On paper, the benefits look similar to — or even better than — state workers’ comp. Both replace at least 70 percent of workers’ wages. Some plans pay 90 or even 100 percent of wages. But there’s one big difference. Benefits under opt-out plans are subject to income and payroll taxes; under workers’ comp, they’re not. As a result, 80 percent of the plans actually provide lower benefits, ProPublica and NPR’s analysis found. Minick said that the analysis missed a key point: Because the plans that offer benefits above the minimum are larger employers, the majority of workers under opt-out plans receive equal or higher benefits. In addition, he said, those companies start benefits on the first day of the injury instead of waiting three days, like workers’ comp does. And their plans don’t have wage limits. As part of the 2013 law, the Oklahoma legislature capped benefit payments under workers’ comp at $561 a week. In March, ProPublica and NPR profiled an injured Goodyear Tire worker whose family was evicted from their home when his income dropped so much they could no longer afford the rent. But the Oklahoma plans incorporate many of the rigid rules from Texas. As opt-out got underway, injured workers, lawyers and even the insurance commissioner quickly learned what that meant. Last March, Rachel Jenkins was working as a job coach and personal care aide for ResCare, the nation’s largest private provider of services for the physically and mentally disabled, when a man attacked her client at an Oklahoma City facility. While trying to pull the assailant off her client, she was thrown to the ground, injuring her shoulder. ResCare told her to bring her client home, and after finishing her shift, Jenkins went to the emergency room. The doctor prescribed pain medication, which knocked her out, she said. 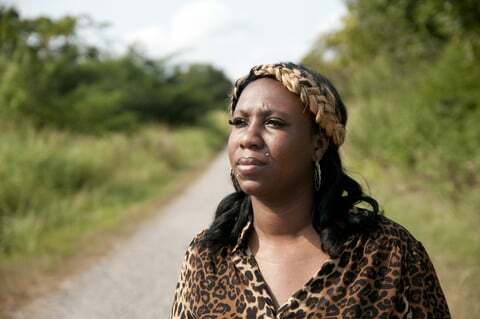 The next day, ResCare sent Jenkins to its doctor, where she called the company’s claims hotline. The adjuster told her the injury wouldn’t be covered because she called 27 hours after it happened — instead of the required 24. “They told me that I should have called the next morning at 10 o’clock. But I was asleep. 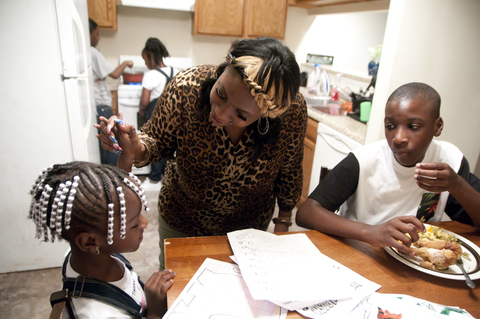 I was on meds,” said Jenkins, a single mother with four kids, ages 1 through 12. Jenkins’ supervisor, who witnessed the incident, complained to the corporate office, and a week later, ResCare reversed its decision. To ResCare and Minick, who wrote the company’s plan, Jenkins’ case illustrates the discretion that companies have, in this case to accept claims even when they’re not reported on time. “The system worked and took care of her and fully paid her benefits,” Minick said. Not so, said Jenkins. Her shoulder remains in constant pain, she said, preventing her from returning to work fulltime. In May, the company sent her for an MRI of her shoulder. Reading it, the doctor ResCare sent her to — an ear-nose-and-throat doctor at an urgent care clinic — noted inflammation and recommended that she see an orthopedic specialist, medical records show. But ResCare’s adjuster wouldn’t authorize it. Instead, the company scheduled an independent medical exam with a doctor flown in from Arizona to review her case. That doctor said the MRI didn’t reveal any evidence of an acute injury that could be causing the pain and instead showed a wearing of her rotator cuff caused by aging. Workers’ lawyers in Oklahoma also noticed that many companies, including ResCare, were using a Dallas physician, Dr. Melissa Tonn, as the medical director responsible for managing workers’ care. Tonn, they learned, not only once shared an office with PartnerSource, she was Minick’s wife. The situation had been an open secret in Texas, where lawyers grumbled privately for years. “Melissa Tonn has a vested interest in PartnerSource making more money,” said James Grantham, a Houston lawyer who has handled about 700 opt-out cases in the last few years. As medical care is often the most expensive part of a claim, Tonn can greatly influence how much claims cost. And that ultimately affects how much money PartnerSource saves employers, allowing it to keep clients happy and recruit more business. Tonn insisted her assessments were based on workers’ conditions and were unaffected by the interests of employers or PartnerSource. “The decisions I make are not based on how much money is going to be saved,” Tonn said. Minick said his wife stood on her own credentials as the former director of two hospitals’ occupational health programs and as past president of both the Texas College of Occupational and Environmental Medicine and a national organization of physicians who evaluate disabilities. The couple were already independently successful, Minick said, when they met at a workers’ comp opt-out conference. As their businesses grew and they started having clients in common, they took steps to keep them separate, he said. Tonn moved to an office one floor up in the same building. And Minick discloses the relationship in client contracts. While opt-out plans have to be submitted to Oklahoma’s insurance commissioner, there is little review. ProPublica and NPR obtained more than 2,000 pages of internal emails between the Oklahoma Insurance Department and companies that wanted to opt out. The emails regarding a chain of long-term care facilities are typical. An insurance department lawyer notes that a paragraph is missing a period, causing a run-on sentence. But he fails to point out that the paragraph promises “no interference” with the doctor-patient relationship while at the same time warning workers that seeing their own doctor “may result in a complete denial” of benefits. Gordon Amini, the department’s general counsel, said the insurance commissioner doesn’t have the power to question such provisions and can’t reject plans under the law. “We are supposed to confirm; it never uses the word ‘approve,’ ” he said. The law also states that settlements must be voluntary. But our review of Oklahoma plans written by PartnerSource showed that nearly every one contains a section titled “Mandatory Final Compromise and Settlement,” which instructs workers that “no further benefits will be payable” if they refuse the company’s offer. After being made aware of the inconsistency by NPR and ProPublica, Amini said the insurance department “immediately took action” and contacted PartnerSource to revise it. Studying the map in PartnerSource’s office, Minick surveyed the country like a commander strategizing the next offensive. In 2012, Tennessee seemed primed to allow employers to opt out of workers’ comp. For the first time in at least a century, Republicans controlled both legislative chambers and the governor’s office. Employers were already pushing for major changes to the workers’ comp system. And the new governor’s family owned Pilot Travel Centers, which had opted out in Texas. But after a series of public meetings, the state workers’ comp division hired consultants who produced a scathing report, raising concerns that letting companies opt out would shift costs to government programs. “Giving firms this option would have potentially significant consequences on some injured workers, other Tennessee employers, and the state taxpayers generally,” the consultants wrote. The legislature passed an overhaul of workers’ comp in 2013, but it contained nothing about opting out. Despite the defeat, Minick started pulling together employers and others. In December 2013, they formed a group called the Association for Responsible Alternatives to Workers’ Compensation. K. Max Koonce, Walmart’s senior director of risk management became chairman. Nordstrom’s vice president of risk management was appointed president, Lowe’s vice president of risk management was vice president, and the chief executive of the Combined Group insurance company was treasurer. Minick became secretary. The rest of the board was made up of top managers at Kohl’s, J.B. Hunt, Big Lots, Sysco, Safeway, Brookdale Senior Living and others in the insurance industry. Joined by Macy’s, Whole Foods and Brinker International (owner of Chili’s Grill & Bar), they paid as much as $25,000 each to finance ARAWC’s efforts, according to association webpages. The group planned to go state by state to pass opt-out legislation, starting with the South. The association’s address was the lobbying firm of Richard Evans, whom Minick had worked with at the Texas alliance. In addition, the group hired Edwards, who ran the successful Oklahoma effort. In each new state, they would team up with connected local lobbyists to navigate the politics. In February 2015, a bill pushed by ARAWC was introduced in the Tennessee legislature that contained a mix of the Texas and Oklahoma laws. Like Oklahoma, employers had to provide a minimum level of benefits — up to three years of medical care, or $500,000. That was less than the benefits provided by the state’s workers’ comp law, which set no limits on medical care. But, like Texas, catastrophically injured workers could sue for higher benefits. Their employers would face limited damages and have additional legal defenses that Texas employers don’t. The bill stalled in April, after it failed to be endorsed by the state’s workers’ comp advisory council. But supporters plan to revive it in the next legislative session. With the Tennessee push underway, ARAWC settled on its next target: South Carolina. As lobbyists, it hired former political directors of the national and state GOP. A bill was introduced in the state assembly in May, with the goal of generating discussion before the legislature reconvenes next year. Rep. David Hiott, a small business owner frustrated with workers’ comp, said he sponsored it after receiving a synopsis of the bill from another legislator and ARAWC’s lobbyists. “They told me they would tell me more about it this fall,” he said. The bill represented a new gambit for ARAWC and Minick. While workers’ comp replaces 66 percent of wages, South Carolina employers that opt out would have to pay at least 75 percent, albeit taxable. They would not be allowed to cap medical benefits and would have to match the state maximum of 500 weeks of death benefits. Burial benefits are three times as high. “The intent of this movement is to pay better benefits,” Minick said. But in Texas, where the movement began, people like Krystle Meloy are hard-pressed to say how it has made things better for injured workers and their families. Meloy was 23 with a 4-month-old daughter when her husband, Billy Walker, fell 180 feet from a communications tower in 2012. Under the company’s opt-out plan, she and her daughter, Kaylee, were entitled to $250,000 for his death. She tried to sue after federal investigators found the company had violated safety laws. But the company filed for bankruptcy a few weeks later. Under workers’ comp, she would have received 75 percent of her husband’s wages until her daughter finished college and until death if she never remarried. Based on his wages in previous years, that would have guaranteed Meloy and her daughter at least as much as the opt-out plan and likely far more — potentially $1 million or more, depending on the circumstances. On a recent day, Kaylee, now 3, climbed up on a cushy chair and flipped through a small photo album containing pictures of the day she was born. Meloy receives Social Security survivor benefits and is applying for food stamps. She’d like to get a job, she said, but can’t afford daycare. Hearing her story, Minick, who climbed radio towers when he was in college, paused reflectively. What’s more important, he said, was which system would provide the best results in most cases. In an earlier interview, Minick described what drove him to launch his crusade to remake America’s system for caring for injured workers. Update, October 15, 2015: After this article published, the Association for Responsible Alternatives to Workers’ Compensation released this statement. NPR intern Courtney Mabeus contributed to this report. Produced by Emily Martinez. 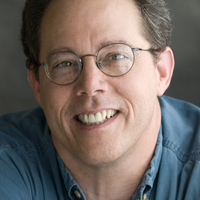 Michael Grabell covers economic and labor issues for ProPublica. 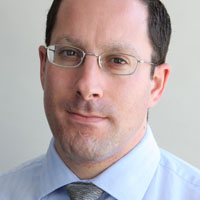 Howard Berkes is a correspondent for the NPR Investigations Unit who has reported on coal mine and workplace safety.